The average American adult eats more than his weight in potatoes (Solanum tuberosum) every year. This annual crop -- a staple in diets the world over -- can be harvested for immediate eating or stored for later use. Be sure to get them all safely stored before they are subjected to a hard frost, or you may lose your crop. Potatoes come in many different varieties, but all are harvested in the same manner. Freshly harvested potatoes on garden soil next to the vine. One of the best indicators for deciding when to harvest your potatoes is the condition of the vines. Let your potatoes grow until the vines die, drying out and turning brown. This very visual clue tells you it is time to harvest. This is not the same as what happens when the vines freeze; frozen vines will turn black and begin to rot. Before you dig up all of your potatoes, check them for readiness to make sure that they are mature enough to harvest and will store well. Cured potatoes can be stored at a temperature of around 40 degrees Fahrenheit. After the potato vines have died, leave the potatoes in the ground another two or three weeks. Next, you'll need to check your potatoes for maturity. Carefully dig up one or two hills of potatoes and pick up some of the tubers. Rub the skin with your thumb or fingers. If the skin slides or rubs off easily, your potatoes are not ready for harvest and won't store well if you dig them now. Leave the rest of your crop in the ground a few more days and then check again. Eat immature potatoes soon after digging, since you won't be able to store them. Seed potatoes used for planting indicate how long it will be from the time you plant them until they are mature, usually from 80 to about 115 days. Consider the times a guideline, since variables in soil conditions, climate and rainfall can all affect how long it takes your potatoes to be ready. Mark the planting date on your calendar and then mark the potential maturity date. Start checking your potatoes near the maturity date and harvest them when they are large enough and the skins don't slip. You don't have to wait for potatoes to mature before harvesting some of them. 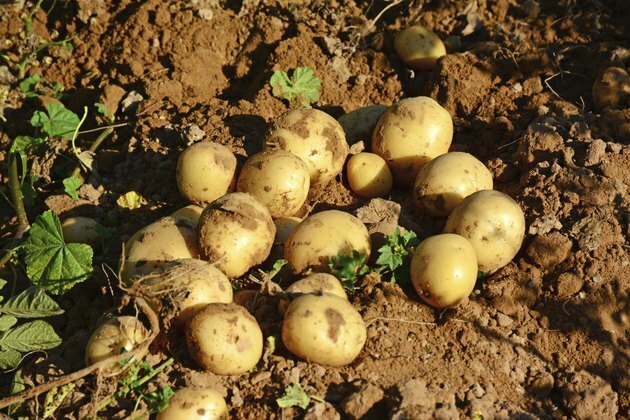 Small, immature potatoes, generally called new potatoes, can be harvested any time after the tubers have begun to form and are an inch or more in diameter. Loosen the soil near a potato vine and carefully dig into the hill or ridge where the potatoes are growing. Remove just enough for immediate use because immature potatoes can't be stored. Replace the dirt to let the rest of the potatoes continue growing. How Deep Do I Plant Potatoes?